Chanteuse Tomomi Itano has returned to the scene with a brand new single and photobook, both due out in February. The photobook titled Wanderer will be released on February 19th, 2018. Just like some of her previous photo books, it was shot by the famed photographer ND Chow. Itano flew to Los Angeles for shooting. It will be 160 pages in total and each copy will come with a random postcard, there are 5 designs in total. Furthermore, fans who order from HMV will receive an exclusive limited edition cover. Doing double duty the visuals and MV for Itano’s 10th single Just as I Am were also shot in Los Angeles. Described as a “grand ballad” full of acoustics, it will be surly be a perfect fit for the former AKB48 member who has earned the moniker “The Voice of Japan” due to her rich and powerful vocal cords. Both the single and photobook share the concept of “self-familiarity”, and showcase the growth in her 7 years as a solo artist. 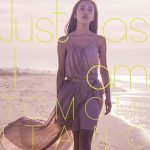 Just As I Am will be released in the standard two versions, CD only and a limited edition CD+DVD. Bonus photos will be included at select retailers. Starting on February 10th Itano will embark on a series of events to support both releases, concluding on March 4th in Nagoya. Just As I Am will be released on Feburary 28th, 2018.